One of my weaknesses is being over enthusiastic about new ideas or projects. I dive right in with endless energy only to short out and realize that I may not quite have enough stamina or resources to make it to the end. I’ve had to learn to step back, plan more thoroughly, and pace myself or those around me. It can be very frustrating. We live in a society that values quick action, fast growth, and bottom line results. There’s minimal time to catch our breath and really look from afar to see if we are taking sensible actions, advancing change slowly, and driving optimal long term results. Alison Eyring is a distinguished long distance athlete enduring incredible triathlons all over the world that would make most of us weak just thinking about it. She is also the successful founder of Organisation Solutions where she advises global executives and companies on leadership and growth. Alison combined her experience and adventures in these two roles to bring us the book Pacing For Growth – Why Intelligent Restraint Drives Long-Term Success. Pacing For Growth takes a unique and relevant approach as to how business should approach sustained growth. Leaders have excessive priorities to focus on to keep everyone happy. They need innovation, increased market share, higher margins, and key employees. The list goes on and on. Often, leaders try to achieve everything at the same time and the result is ultimately achieving less. There needs to be a balanced approach to growth. If you grow too fast you will burn people out, miss opportunities and lose momentum. Growing too slow will result in lost momentum, stalled technology and new product lines and the competition will reach the finish line first. So what is the answer? Intelligent Restraint. Intelligent Restraint is a term that Alison coined through her years of consulting. It is a balanced long term method of approaching business decisions. The idea is to push teams, change, and the business as far as we can but within our capacity. Slow and steady wins the race. This may mean accelerating at one time but pulling back and slowing another. Leaders need to have the patience to build capacity for growth which translates into new capabilities from inside the organization. Growth and capacity work together but need to survive the test of time. Pacing growth enables us to build capacity for future success. 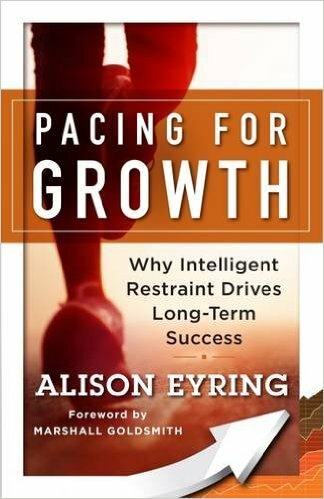 Pacing For Growth is divided into 3 parts to effectively illustrate what Intelligent Restraint is and how to engage it within an organization. Part 1 outlines the principles themselves. Part 2 reviews the rules of Intelligent Restraint. Part 3 offers ideas, tools, and examples of putting this principle into action. Following is a synopsis of each part to whet your appetite or paced growth. Capacity determines how far and fast you can go – maximum capacity is the absolute peak performance that a system can perform at without crashing. The right capabilities increase capacity – Alison focuses on two capabilities in particular in her book, outside-in thinking and customer-aligned innovation. The right pace wins the race – we all know what happens when we push to fast and run out of steam. Focus overrules vision – growth needs to be more than just a vision. Routine beats strengths – strengths can ultimately become weaknesses and routine will “conserve energy” and help create new methods of thinking. Exert, then recover – continual exertion exhausts people, systems, and cultures. It’s critical to know when to take a step back to recover in order to stay on the path to long term growth. These rules are critical to making key trade-offs and decisions for teams and the business as you build capacity for growth. The final section of Pacing For Growth brings everything together for us. Alison shows us how to put Intelligent Restraint to work. First, we need to focus on scaling to grow. Leaders need to increase capacity fast enough but pace the change and growth within human and cost limits. She suggests picking one capability at a time to focus on developing faster, rather than several. Alison stresses how critical routines are in making this happen. For instance, you should create the right routines for development, find routines that really stretch people and systems, create new routines that build sound decision making capabilities, or use them to “leverage moments of truth”. To maximize development Alison shares her FAST framework that she utilizes with leaders. FAST = Focus, Act, Support, Test. In the book she leads us through the framework to catalyze growth in a responsible manner. I am a visual person and stories always bring new information home for me. Alison devotes a chapter to sharing real experiences in the trenches from leaders. These are people who have put Intelligent Restraint to use and this really helps to bring the concept home. Moreover, it gives us food for thought about how we can use her thoughts in our own roles. Pacing For Growth also ties up all these concepts with some online resources including a Pacing For Growth checklist that is relevant, simple, and practical. Pacing For Growth offers a sound and practiced approach to growing our organizations within capacity. Today, too few companies take a restraint growth attitude towards growing which only has negative impacts on people, systems, and processes. Corporate America needs to adapt a long term growth mentality so that they are around in the future. Alison shares stories about icons that have flourished or failed over the years, leadership tools and tips for pacing growth and capacity, and keeps us mesmerized with her own personal stories and experiences. How many times have you been in someone’s office and they have several business books propped up on subjects like leadership, motivating people, or teams? Generally they have light dust on them and haven’t been cracked open since the person first touched them. Don’t get me wrong, I have a passion for books and learning - I’m a reading nut. If you are going to keep a book around shouldn’t it be one that you reach for more than once? If I were to have one desk book it would be Discover The Joy Of Leadership – A Practical Guide to Resolving Your Management Challenges by William G. Steiner. Willy’s book is a mastery of leadership tips, tools, stories, and real life examples of the challenges of being a leader. Each chapter can be read individually as a quick reference to work through any situation or questions you may run into as you move throughout your day. Willy views leadership like a house supported by building blocks. Image the house roof as the pinnacle of leadership with 4 blocks supporting below consisting of time, communication, relationships, and change. Each block is integral to leading teams. An imbalance in the house can wreak havoc if there is any instability. You and I both know that we run into situations daily that can bring instability or may weaken teams. Each of these 4 blocks is broken down into sections in the book so that you have a resource at your fingertips whenever you run into a blockage. First, Discover The Joy Of Leadership effectively reviews some of the top leadership thoughts we have today. Some of them bring the message home through stories offering a wealth of insight and ideas. For instance, as a leader you need to know your “why” and how your purpose will drive your personal leadership. We are reminded of the great Peter Drucker and some of his key principles. What do we have in common as leaders and how do you peek beneath the surface to learn what is really happening in your area? The leadership section has so many valuable chapters to absorb in the short time we all have as busy people. Willy examines all aspects of time. We are all given the same amount of time and how we use it and approach it is up to us. We learn how to bucket our time, chunk it for productivity, make it our ally, gain control over your minutes, and beat the clock. Most importantly we are offered solutions to shorter meetings, being productive, mastering your email, and making time for the critical pieces such as your people. Who doesn’t need help with time? Communication can be destructive if managed poorly. You only have to look at what emails and texting have done to us in the past several years. We don’t pay attention. We try to shorten everything and we assume we understand. We fail to master the process of communication. You will not have impact if you are a poor communicator. More importantly, listening is becoming a lost art. It’s almost sad that there are actually classes on how to be a better listener with steps on how to listen with intent. One of my favorite chapters was the listening challenge and how to use silence to your benefit when communicating. Willy offers some great insight and advice in these chapters – one’s that I will review repeatedly. If there is one thing that most people are scared of is change. The mere word sends shivers down the spine of those that need consistency and order. Unfortunately, change is only intruding in our lives more every day. We need to work with and face the fear. This house block needs to fluctuate, but be managed. Willy introduces some change management models, myths about change, and how you can fight misconceptions. Leaders need to understand the need for change and be able to communicate it. See how the building blocks of our house are intertwined? Relationships are often the most difficult challenge we all face in our personal and professional lives. We can control systems, work flows, and technology, but people can really throw us off. There are so many intricacies with people. Who are our allies? What about our adversaries? How do we balance personalities and conflicts so that we can build trust and more importantly, engage employees? Again, the relationship block of our leadership house needs the support of the other factors of communication, time, and managing change. Discover The Joy Of Leadership arms us with some tools and strategies to work with people to build relationships. Even the most effective leaders need support. Often when we are scratching our heads with indecision we need a quick guide as to which path to take or how to attack a problem. 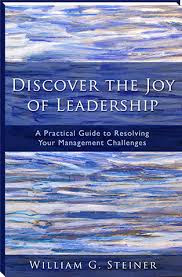 If you have Williams G. Steiner’s book Discover the Joy Of Leadership on your desk you will know exactly where to go. When I was young we spent all day outside playing. There were no video games, IPads, or cell phones. The coolest toys were the ones that we made or manipulated. On a sunny day the best toy to have was a kaleidoscope. Remember those? We held it up to the light and a magical world appeared inside. Colors morphed into one another and we could make our own color movies. Every turn of the instrument was distinctive and memorable. The word kaleidoscope comes from the Greeks. “Kalos” means beauty, “eidos” means form, and “skopeo” is to examine or experience. According to Chip R. Bell author of Kaleidoscope - Delivering Innovative Service That Sparkles” If you bring them all together you have “experiencing constantly changing beautiful forms”. When you compare the magic of a kaleidoscope to the wonder of exceptional customer service you’ve offered your customers a sprinkle of innovative service that builds relationships and forms lifetime bonds. Chip R. Bell is the master of offering service that not only goes above and beyond, but surprises and delights customers. Imagine if you could consistently draw clients in, shower them with the unexpected, and send them out as ambassadors for your unique service. In his book Kaleidoscope Chip shares nine different “shades” of colored glass in a kaleidoscope. Each of the nine represents a “value-unique service” and how to deliver it. Following are the 9 elements for innovative and memorable service. Enchantment – Add a little sparkle and delight your customers. Avoid “black and white” service instead; put them under the spell of service that shows your desire to truly serve. Grace – Honor your customer. When I think of grace I imagine simple, sophisticated, and elegant. Be proactive with your service yet, deliver it with class and with an attitude of real goodness. Trust – Keep your covenants. Trust is the lifeline and base of your business. Give service that is relationship based, not profit based. Generosity – Serve it forward. Make your service a reciprocal act. Always give more than is what expected and it will come back full circle. Truth – Nurture total candor. Always be honest, never hide from customers. Alliance – Stay.. on purpose. You have a relationship with your customers and you need to make them feel empowered and in charge. These are powerful shades that you should be showering customers with. Chip suggests that “enchantment” and “passion” are like colored stone bookends of your service. Each colored glass has a unique benefit for innovation and unusual service that makes up the kaleidoscope of customer service we expect as consumers. Chip’s book is one of the most effective books that I’ve read that really draws the reader in with stories. The stories are the meat of the book and drop us into a world where innovative service is experienced and we see the tangible outcomes. He shares tales of delightful service across industries that drive home the need to offer innovative service. There are numerous quotes to keep the reader thinking. He offers different tools that you can try right now to change the way that you look at, and deliver, exceptional service. You will learn how to serve others and create relationship and loyalty. You will learn how to make your own kaleidoscope. Turn your service kaleidoscope on clients so that they can see, touch, and feel the many facets of your business and service. Let them bask in the light and unique “shades” that service can bring. Give them an experience like no other and invite them into your world. 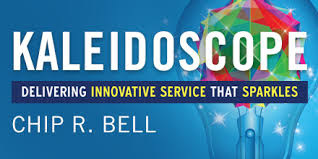 Let Kaleidoscope by Chip Bell show you how to provide service that drives the unexpected to clients, builds trust and relationships, and brings them back for more experiences. A few years ago I joined a company that had just been rescued from the brink of collapse. Operations, product, and staff had to be ramped up. It was a tedious and confusing time orchestrating change. The sentence that I heard nearly every day washed over me at first in my newness to the team. Then, it quickly annoyed me and I understood one reason that the company down turned in the first place. The words? “That’s how we’ve always done it here”. Hmmm. Those words explained everything. How many times have you heard these common phrases in the past few months? These my friends are “expensive sentences”. They can cost your company time, money, and resources. These sentences are so common that we believe them without further thought and too often nod in agreement. These words may impact egos, represent lost opportunities, limit dialog, and can set up barriers between departments. We are all so busy (or so we tell everyone) and projects move so fast that we fail to step back and look at things from a fresh perspective. We need to halt expensive sentences. As teams, we need to figure out how to identify these rascals. Next, we need to question them and discover any problems that they may represent. As a result we may be able to right size our traditional assumptions and show teams how to rethink obstacles and outcomes. Jack Quarles is a veteran of the world of status quo and vagueness. As a consultant, he’s heard every expensive sentence there is. He’s lived and witnessed too many companies falling into the sentence trap. Jack responded by bringing us the book Expensive Sentences – Debunking the Common Myths that Derail Decisions and Sabotage Success. Expensive Sentences is a must read for anyone who works with teams, budgets, or vendors of any size. By looking beneath the surface of each sentence, we learn that we may have more options, can form better relationships, and can conserve money and resources. Jack shares 3 primary expensive sentences which include “stuck” messages, “special” slogans, and “scarce” lines. After identifying a sentence he leads us down the path to rejecting or debunking the myths and then offers us insight into how to discuss the sentences with teams to bring about constructive dialog and turn these words upside down. As projects progress we often find ourselves stuck and not sure how to proceed. Too many people fear starting over for a variety of reasons so arms are thrown up in the air and the words “it’s too late to turn back now” are muttered. We find ourselves stuck and know resources have already been allocated, so how do we get unstuck? “Special” messages muttered include “we’re different” or “we trust them”. These are often said with pride as if they are a get out of jail card and can justify decisions or business relationships. Too often we hang our hat on these phrases and ignore what is in front of us. So many companies are working with scarce resources. This can cause misguided decisions that may bare a heavy cost down the road. Sentences like “we can’t afford to let him go” or “we can probably do that ourselves” should be warning signs. How many times do leaders preach “the customer is always right”? This sentence can become very expensive and dent a company’s reputation. Every customer is not right for us and we should only serve those that make a business case for our success. You can probably think of more sentences that cost time and money. As a consumer how many times have you heard “this price is only good for today” or “it was on sale”. These words should always set off an alarm. Perhaps you never realized just how easy you have fell victim to “expensive sentences”. They float around like coffee in a majority of our companies and we become numb to them. How many times have you sat in a meeting and heard the expression “the customer is always right” and let it wash over you? Have you ever really stopped to examine if it is true or a myth? Perhaps it’s time that you start questioning more and accepting fewer expensive sentences. 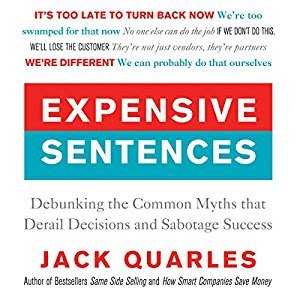 If you are ready to stand up to myths and dig for greater efficiency, stronger relationships, and fewer expenses, you need to pick up Jack Quarles book Expensive Sentences to bring change.